I admittedly lead a surreal life. Not perfect, or textbook, or even remotely conventional. But surreal. 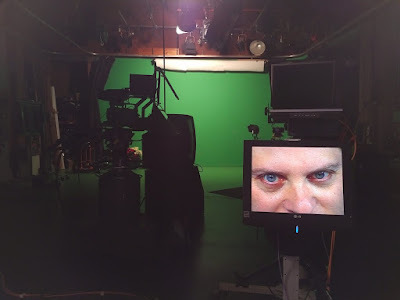 For example, I often find myself staring down the barrel of a television camera. And as the technical director (on this night, it was Elvin) works his usual magic to make live interviews happen - framing, sound checks, color compensation, lighting, tending to my diva-esque needs, you name it - I often think about how to best capture what it's like to be on the other end of the screen. It's tough to shoot into the camera because the set lighting is so bright. But sometimes I get lucky and I end up with a snippet, a quick pixel grab that tells the story of the last few minutes before we go live. As you can see here, we tend to enjoy the moment. Which is entirely why I always look forward to the next interview almost as soon as this one is done. Big Brother-ish horsing around notwithstanding, I realize how lucky I am to sit in the chair. Your turn: Do you get nervous when the spotlight is on? How do you make the jitters go away? Note: This photo continues this week's Thematic blue theme. Feel free to share yours here. Yes, I know I'm stretching it with my baby blues. Thanks for indulging me.